It’s never been easier to search the world’s diamond vaults for the absolute best quality and value. From your armchair, all of a diamond’s cuts, carat weights, clarity, and color are virtually at your fingertips to compare. 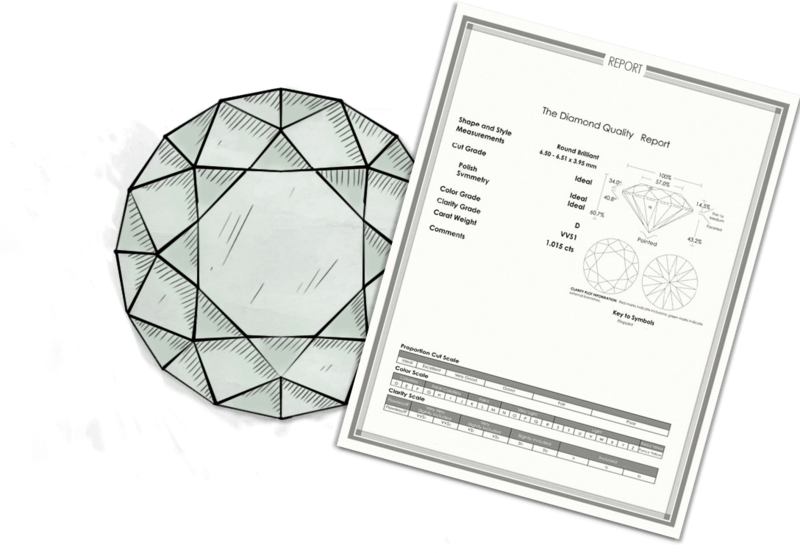 Be careful, though, because with all that convenience it’s easy to get caught up with technical descriptions of a diamond’s certification – instead of the diamond itself. In fact, rarely (if ever) do even professionally trained, veteran diamond buyers make a purchase decision from a certification alone. How the diamond actually looks is what’s paramount. Does it radiate with brilliant, mesmerizing sparkle on the finger? Does it catch the light of the room and remind you why it’s there in first place? 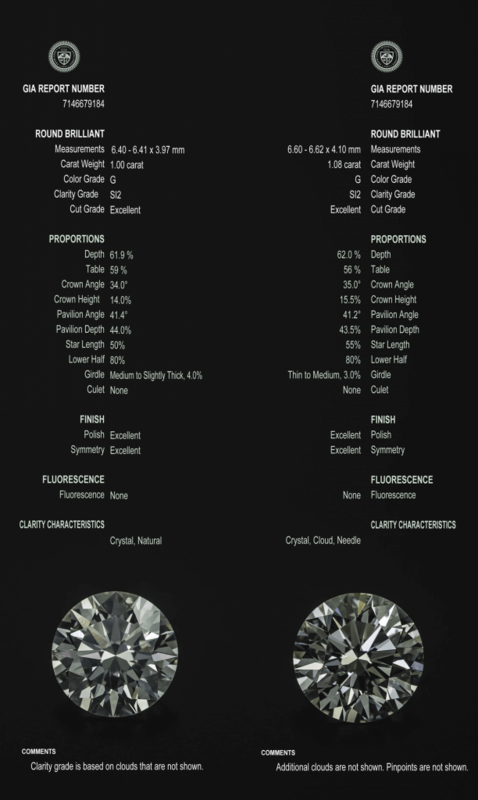 While the 4 C’s are all key factors in selecting the perfect diamond, they simply can’t answer these questions on their own; you really have to see a diamond for yourself to know. And so while it seems crazy to buy a diamond you’ve never seen, from someone you’ve never met, it’s become a norm for online purchases. It’s easy to get caught up in finding the biggest and most clear, colorless diamond for the least amount of money, scrolling through hundreds of certifications with all the romance of a Dewey Decimal search in the library just to find it. But we think you should actually see your perfect diamond and compare it among others to ensure it’s the right one, as many very different looking diamonds will appear identical on paper. Promise, no doctoring to this photo has been done to dramatize the effect. These two diamonds pictured above look the same on the certificate, yet appear very different in person. One is clearly ‘crisper’ than the other, like a freshly cleaned mirror. So, what gives? If the 4 C’s on the certification are the same, what is missing? A diamond’s clarity grade is based on the visible amount of microscopic crystals that formed in the gem at its birth, eons in the earth’s deep past. These tiny crystals may deflect light away from your eye, which causes a milky or cloudy effect in the gemstone. Can you guess which diamond in the image above has more of these crystals? Of course, it’s obvious. Nonetheless, these types of inclusions are generally not shown on the plot of a certificate. They’re so small and numerous that it would be far too cumbersome to report, especially if they’re not deemed significant enough to effect the gem’s ultimate grade, and subsequent value. So they don’t show up, because they apparently don’t matter enough, but they will completely change the way the diamond looks. You would never know that the diamond wasn’t as stunning as the other unless you physically saw it to compare. What Else May Be Missing on the Diamond Certificate? While these little pin point crystal inclusions account for a majority of hidden differences, there are all sorts of subtle attributes that can equate to big disparities. For instance, fluorescence – that is the amount a diamond will glow under an ultraviolet light to reveal otherwise hidden mineral traces – is reported on the certificate, but bears little relevance to how the diamond will look in a ring on your finger. Most of us don’t live under the glare of an ultraviolet lamp, but hopefully we do get out in the sunshine – how does it look out there? That may better satisfy your own fluorescence criteria than a report alone. Another important contribution to how bright and sparkly a diamond can be is its scintillation, that glittering iridescence that makes the diamond almost appear as though it’s on fire. A grading certificate will report the quality of the polish, and that is indeed a gauge of scintillation, yet it does not detail its facet arrangement. Diamonds cut by hand will conceivably differ slightly, which will affect their overall scintillation. The take away here is that no two diamonds can really ever be exactly the same and it’s best to see them side by side with your own eyes. 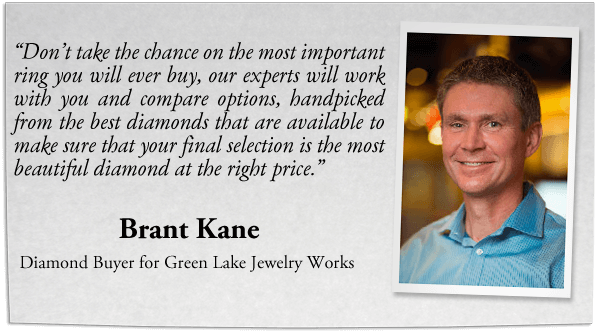 Just as each ring at Green Lake is hand crafted and custom made, our diamond collection is hand selected. We source our gemstones directly, negotiating hard for the best value for our clients and accepting only the most beautiful diamonds while returning the rest. 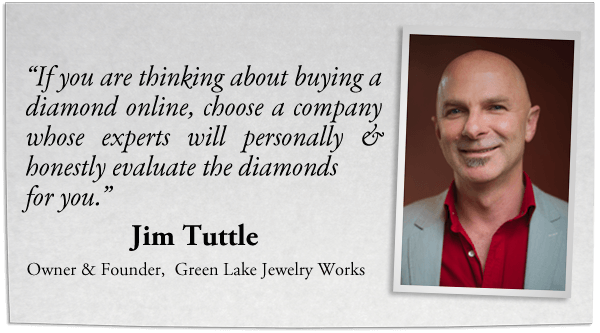 Whereas most online sites don’t personally view the individual diamonds they pick from a list and send out sight unseen, Green Lake meticulously inspects every diamond we present. We are artists who put just as much passion into gem selection as we do in our craft of fine jewelry making. Be it in our Seattle studio or through our website, it’s our gemologists, designers, and jewelers – not salespeople – who seek to provide you with the perfect diamond. Because our singular aim is to create the most beautiful rings possible, to out-do ourselves again and again, it’s in our interest to connect clients with the absolute best diamonds available within their respective budgets. Eric Robertson is a writer, illustrator and creative lead for Green Lake Jewelry Works.